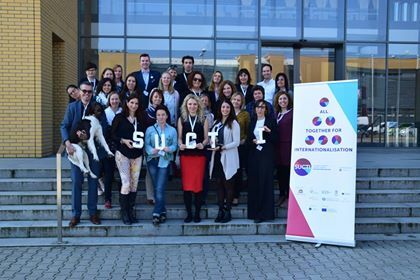 The SUCTI Trainers Network was officially constituted during the Train the Trainers Week at Adam Mickiewicz University (AMU) in Poznań (Poland) from April 8-13, 2018. Three trainers from all partner universities (AMU, Justus-Liebig Universität-Giessen, University of Porto, Universitat Politècnica de Catalunya, Universittà Cattolica del Sacro Cuore and the coordinator: Universitat Rovira i Virgili) are members of this Network. The SUCTI Trainers Network has the objective to bring together all the SUCTI Trainers and be a platform to exchange good practices, training resources, materials and activities so that the SUCTI trainers continuously evolve and are linked to each other, to the Project and to its objectives. Externally, this network can also be a way for other institutions to contact a SUCTI Trainer for more information on how to implement this course at their own institution and thus create a multiplying effect. Welcome on-board, SUCTI Trainers! We are happy to see the SUCTI Family growing! In the Trainers Zone you will find your access to Moodle, materials that you can use in your training courses, useful resources and a lot more! This is YOUR Network now! Welcome!